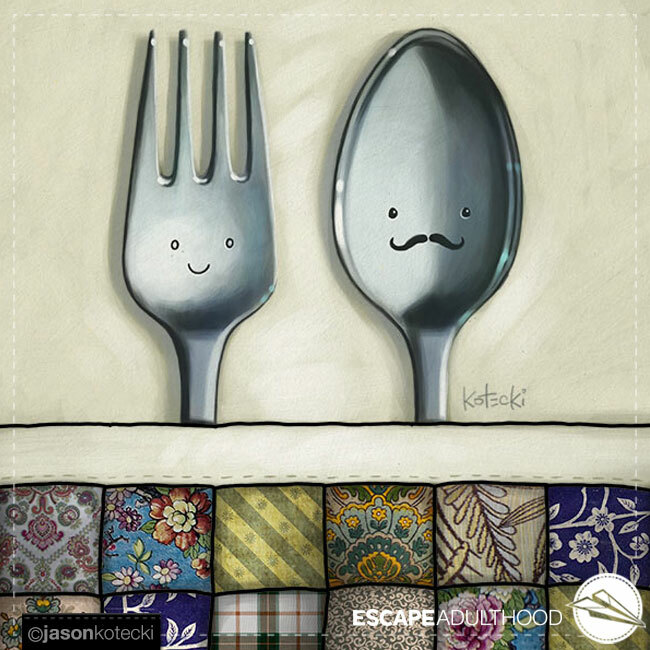 “Fork & Spoon” by Jason Kotecki. Prints available here. I’ve been married for almost 18 years. Every single night that I’m at home, I sleep on the right side of the bed. Why? How did that come about? I don’t ever remember having a discussion about it with Kim, and yet, here we are; our assigned spots have not changed since the day we got hitched. Why do we do any of the things we do? The little habits that make up our days, where did they come from? Which way do you take to work? How do you typically run your meetings? On-board new employees? Welcome new customers? Deal with angry ones? What’s the first thing you do when you get out of bed in the morning? How do you acknowledge the birthdays of the special people in your life? What kind of cookies do you make for Christmas? We have too many things to think about and process in a given day, so we help ourselves out by putting a lot of the routine stuff on autopilot. The problem is that we rarely re-evaluate these routines and how they got started in the first place. Is our original thinking outdated? Is there new way of doing things that could be more efficient? More useful? More fun? Would we be better served to eliminate the routine altogether? I wonder what would happen if you and your sweetie switched sides for a night? Wait, never mind. Too dangerous. The fragile balance of your relationship and the whole space-time continuum might be thrown completely out of whack. Perhaps this is one of those rules you’re better off obeying. After my husband and I were married 19 years, we finally switched sides due to health issues. Wow, what an adjustment, especially in love-making! But it has turned out to be a blessing by forcing us out of routine to try new things. Marriage is such an adventure!